Welcome, March! We've created another free calendar to share with you and would love to hear your feedback. While we're having fun making these, we'd love to know - would you like to see us do more? Do you download them to use on your computer screen, or perhaps print them to use in a planner or on a bulletin board? Let us know! I can't believe it's March already! Thanks for the calendar and dates of importance, especially Puppy Day! Yes! Love these! I print and put on my wall at work, they make me smile. There is a LOT going on in March, it is high summer here and we are so busy outside in the garden, with lots of cat help! I love these. They look so cute. I don't actually print them but you do often remind me of key dates I might have forgotten. 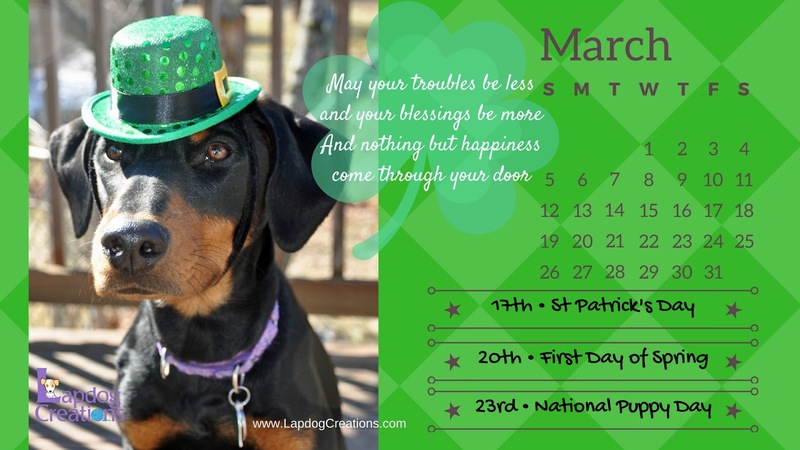 We love St Patty's and took some fun photos and of course who doesn't love Puppy Day and spring. Love these - we print these and stick them on our computer! Thank you! YAY ... winter is only ... 6-8 more weeks for us! LOL WE are paperless as much as possible. Great calendar. We published a weekly planner this year that include a lot of fun "holidays" to help cat bloggers with their blogs. Such an adorable calendar! Good news that spring is on the way... although it's been in the 70s here for a few weeks now! Penny looks great in her St. Patrick's Day hat! I appreciate seeing the calendars with the special holidays marked down. I sometimes go back to your site and look at the upcoming holidays because it is more fun than writing it down! I don't download them because I am running out of room! Super duper cute calendar. I still can't BELIEVE it's March! Very festive. We're eagerly looking forward to the first day of spring! Happy March 1 - do you all say "rabbit rabbit" for good luck on the first days of each month? ;) I love your calendar concept. I bet folks use it for their desktop although I must say that I use a printed doxie calendar. I'm addicted to writing things down and crossing stuff off! Like winter! Cool calendar and I love your hat! Thanks for joining the Thankful Thursday Blog Hop! This is our first visit to your blog, so I'm not sure how i will use it. I will use it tho, you can be sure of that. It's an awesome calendar, and we thank you for sharing it with us. You're so creative with your calendars, and I'll bet tons of people download them. As others have said, I'm a paper calendar kind of person. I like to check things off. But if I did use a desktop format, I'd use yours for sure! I really like these a lot, they're so pretty and I love the quote on this one. I'm going to print it out & tape it on the wall in my home Pawffice! Penny looks so cute in her little hat!